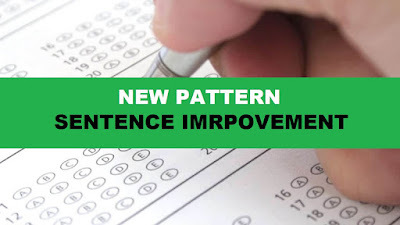 Today we are Providing Based on New Patterns Sentence Improvement Questions with Solutions for Bank Exams i.e. IBPS Clerk Exams which is going to be held on January. Here 20 Questions is given, Just go through the directions properly and solve these types of Pratice sets regularly to crack any Government Competitive Exams. English is the only key point through which you can easily beat your competitor. Directions(1-20)Each of the question has a part highlighted. Choose the correct option against each sentence which can be replaced to form a perfect sentence. If he have time he will call you to remind you about the classes. I am used to work hard. He is unlikely to come to the party tomorrow. The passengers have formed queue at the booking counter much before a train arrives. You must complete this work upto sunday. One of the factor for her failure is the lack of concern for others. In reality, this policy will only lead to more corruption in an already corrupt environment. At currently estimates, the cost of modernizing the airport would be more than double the earlier estimates. No of these moves brought credit to the management. I am afraid you two are at cross purpose. Take care that you are not to be cheated. Can you tell me where has he gone? No sooner I heard the shot when I rushed to the spot. Hardly he had entered the station, when the train whistled. Let's go for a walk, shouldn't we? The teacher asked me what is the matter? Solution 1. Option A because 'has' is the correct term here and not have. 'has' is generally used for singular person. Solution 2. Option A because 'she' is the correct way of addressing the subject that is in second person rather than using a pronoun. Solution 3. Option E is correct because 'work hard' is denoting an action. Solution 4. Option E because 'unlikely to' is the correct term here. Solution 5. Option C because form is the correct type of verb whereas 'formed' denotes a past word. Solution 6. Option B because 'by' is always used to denote a particular time frame. Solution 7. Option A is correct as 'If it rains' is the correct form of verb here. Solution 8. Option B as 'yet to meet' means haven't met yet. Solution 9. Option C as 'One of the factors' means one out of many factor. Solution 10.Option C 'among' means out of many. Solution 11.Option D 'current' is used to denote the present time. whereas currently means the present running situation or time. Solution 12.Option B as 'Some of these' means some out of many options. Solution 13.Option A 'always be' is the correct form here. Solution 14.Option A as the preposition 'in' is the correct term here. Solution 15.Option C 'that you are not cheated' is perfect here. Solution 16.Option C 'where he has gone' is right here. Solution 17.Option C 'No sooner... than' is the perfect term. Solution 18.Option A 'Hardly had...' is the correct way of beginning here. Solution 19.Option A 'shall we' is the correct term here. Solution 20.Option C 'What was the matter' denotes a sentence in past form.